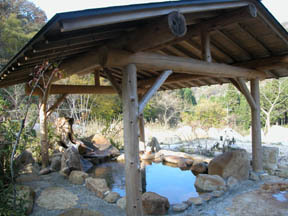 The kind inn which delights the smooth tepid spring of a hinogami with free-flowing hot-spring water.When I had a hot spring shown for the first time, he has noticed that it uses the hot spring and was surprised at free-flowing hot-spring water.surely -- fuel cost -- true, when it is heard -- although it was serious, since it was heard [ not making it better for atopy to circulate and ], ... and a gentle madam answered.Although the cottage home was entitled, it could stay calmly, the sunken hearth was surrounded and the price of the row slices of the 30cm over char which receives the enough-volume dish which cannot be considered, is especially raised from a fish preserve, and is built was very as delicious as salmon pink and a Puri-Puri. It was surprise at the Tanabe.It is if the fixture also of the Nita rice will be carried out to a buckwheat noodles as well as vegetables and wild grass if I hear it since the tractor was put on the shade of a house, and meals are provided on their own account.I had a bowlful of summer vegetable shown, and had the fish farm where char, a trout, and a carp sail in the field and hill at the back of the back, and a buckwheat-noodles field vigorously shown.that is right, then char is fresh slices of live fish arranged to look lifelike at a dish grilled with salt -- since a house has only it when I hear that it is -- a husband.I would like to have come to obtain the dish of a char all and an own account all anew. Compared with the time of new building, deep green is cool. A wooden feel feels relieved for the bare feet which have covered the whole building with thickness 1-sun the cedar plate for 3 minutes. What and free-flowing hot-spring water! Very exceptional with the heating hot spring of a mineral spring. 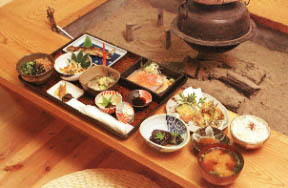 Char dish of wild plants. It is a field of the back and she is a madam. The husband who showed the side field and the fish farm. # Rice, a buckwheat noodles, vegetables, wild grass, river fish, etc. are mostly own account foods. The mushrooms (Koutake etc.) of char and a trout, and wild grass (Kogomi-fern and bracken, and royal fern - wiping - wild leaf bub etc. ), a cultivated mushroom (maitake mushrooms and king oyster) and a mountain, etc. 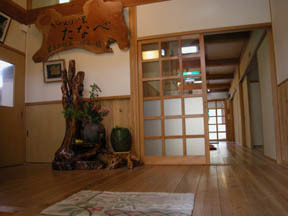 Meal place: The wooden floor of an every morning and evening sunken hearth, a group unit. 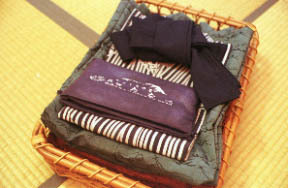 The man and woman each 1, the bathtub of a white tile, a smell with a hinoki sufficient [ a wall panel ], and a hot spring are free-flowing hot-spring water. Two places The open-air bath of H15 establishment is also a method of a smooth touch as free-flowing hot-spring water and an alkaline spring are smooth. At the Yokota station or the Shozan station. * 2 or more persons.